We’ve been in this party business for a while now and it’s amazing what you learn. On the one hand holding a child’s birthday party is the easiest thing ever. Your child will love the idea of a party, will live for the party for weeks in advance, excitement mounting. And they will not care how organised, professional, or perfectly managed it is or is not. You, on the other hand, will probably worry and fret and feel like there are a thousand things that could go disasterously wrong. The truth, of course, is somewhere in between. But it is always worth remembering that no matter what, your son or daughter will think that any party you throw them is the best EVER! To help you along with the organisation of your event we have put together two documents for you to download. The first is Mrs Fox’s Party Masterplan. 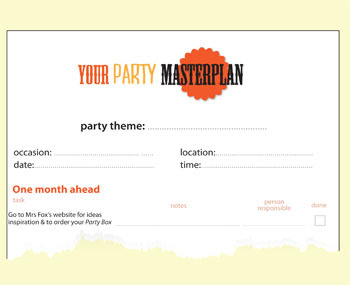 It helps you get organised from one month out and is a geat aid memoir when planning your party. 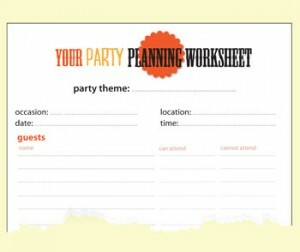 The second is Mrs Fox’s Party Planning Worksheet and this will help you define the party and keep a top level list of guests, menu, activities & music etc. Of course the best thing you can do to help you get organised is simply order a Mrs Fox’s Party Box and let her do all the work for you.